Considering the Q2Q More Than Just a Bridge | Billard Architecture Inc. In 2008 the City of New Westminster embarked on the process to realize a pedestrian and cycling link from Queensborough to Quayside. This is truly a necessary part of unifying our community. Queensborough is a growing and dynamic area that has been somewhat cut off from the rest of New Westminster both culturally and physically. Providing this fixed link would not only facilitate a stronger sense of belonging but also enrich our area. Imagine walking to the Skytrain, more businesses and being connected. Since 2008 various options have been proposed for this bridge and in December of 2015 an Open House was conducted showing the present status of the process. The current proposal is a double bascule bridge which entails two draw bridges that enable the marine traffic to use the Fraser River without interruption. So far, this is the best option to meet the required height clearances required for marine traffic and fit the landscape. This design requires two elevators, stairs and two draw bridge components (read: lots of long-term maintenance). Pedestrian/cyclist bridges are huge in Europe. When a city like London, Copenhagen, Paris or even smaller cities like Newcastle on Tyne recognize the need for a new bridge, the process is given great attention. Often design competitions are held where Architects and Engineers from all over the world compete to win to design. The designs push the limits. They are meant to be works of art and to attract the community (and often the world) into realizing what could be both functional and beautiful. Instead of doing what we’ve already done with the Skytrain and Alex Fraser bridges, we could stand out. We could build a destination bridge. We designed an arc that will protect the ecosystem of the Fraser River and provide safe passage to the marine traffic with fewer parts requiring long term maintenance. Accessible for all without stairs or elevators. While our concept is longer, the design offers walkers and cyclists a chance to enjoy the view and be a part of the landscape. New Westminster has made significant in steps toward creating a very dynamic and vibrant community through strategic use of public art and Architecture. 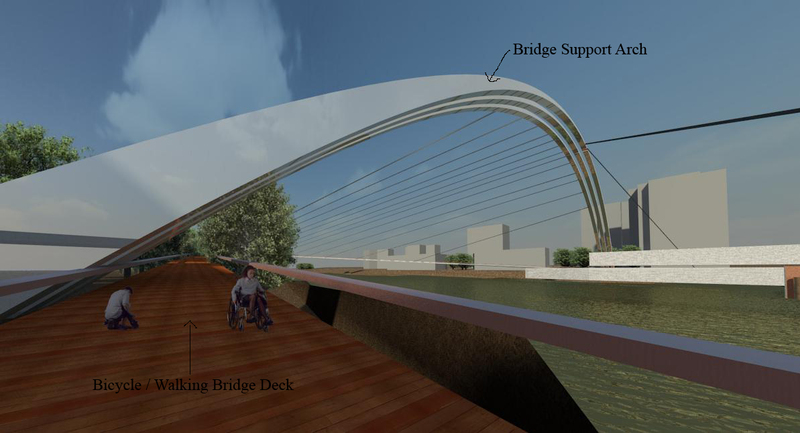 Treating the design of the Q2Q bridge as an extension of this endeavour would serve to not only meet the needs of our community but also to make a bold and significant statement.